Join the discussion on our forums! Come discuss Backstreet Leper over in our dedicated Backstreet Leper discussion topic. Quit playing games with his heart. And his fingers. And foot. It's rude. ...I just learned today that this is a card. i'm trying to make a meta defining n'zoth leper deck, blizzard please buff. It boggles my mind why the heck didn't they make it do 3 damage. It would be like a reverse Wolfrider, and be a cheap drop option for Deathrattle decks. It probably wouldn't break the bank to up the deathrattle to four damage, since this is almost always going to die inefficiently for 3 mana. I wouldnt guess they were gonna print a worse card than magma rager. Lets all be honest, we are much happier to see this card be bad than good. It's still OK for giving me a reason to yell out loud "BACKSTREET'S BACK ALRIGHT!!!" when I throw this card down in my Pirate Warrior deck. He's throwing a Volcanic Potion. This card is Meta Defining. It's like the Piloted Shredder given a completely new tier of power and grandeur. Welcome to the future of Hearthstone. This cards looking at you, kid. Oh, just what we needed! 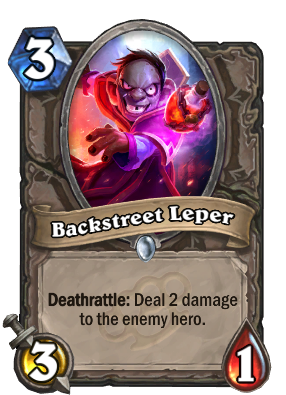 A worse reprint of Leper Gnome. Team 5 makes me feel icky. At least the card art looks good. Definitely the worst card of the expansion so far. Maybe an indirect way to nerf Journey Below? Nope, even this expansions Magma Rager is better! I mean, you could say Duskboar is closer to Magma Rager than Am'gam Rager as well so, why not both? While this expansion seems to be shaping well, there's one notable distinction between this expansion and WOTOG. I guess you've never played Arena. I was referring to constructed,not arena.